Published in 1991, these are transcripts of original notes from the laboratory of W.J. Hooper, for specific days between Feb. 4, 1969 and Aug. 10, 1970. You will need New Horizons or The All-Electric Motional Field Generator. An aid for the fuller understanding Hooper's work. These experimental notes of Dr. William J. Hooper are being published at this time because all patents on the device used in these experiments have run out, and because I still believe in the validity of Dr. Hooper's theory and work. I believe that when the time comes that his theory is proved and made useful, it will be the start of a new era for mankind. These notes will be of no value unless the reader has a copy of either Dr. Hooper's original work, New Horizons in Electric, Magnetic and Gravitational Field Theory, or my summary of his work, The All-Electric Motional Electric Field Generator and Its Potential. When I first started working with Dr. Hooper in March of 1968 as his secretary and laboratory assistant, we had two mechanical motional electric field generators fabricated, and we began testing them. So many problems developed because of the magnetic fields of the magnets in the generators and the noise and vibration of the motors that were turning the magnets that it seemed impossible to get any measurements that were meaningful. While contemplating how to overcome these problems, Dr. Hooper conceived the design of an all-electric motional electric field generator which, if it worked, would also prove his theory of gravity. Over a period of many years, Dr. Hooper had performed many experiments to prove that the motional electric field was incapable of being shielded. These experiments are described in his original work, New Horizons. Another experiment that was done on December 16, 1969, is described in this publication. Because the gravitational field cannot be shielded he theorized that the gravitational field is a motional electric field produced in atoms by the motion of electrons which are miniature magnets. In the all-electric motional electric field generator, we were not endeavoring to measure the field created by the electrons in the materials of which the generator was made, but the minute simulated gravitational field created by the electrons as they drift through the copper wire at a velocity dependent upon the potential difference applied to the wire. 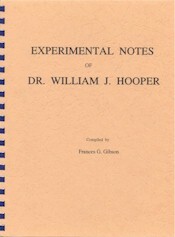 Dr. Hooper's original manuscript, "New Horizons," details the development of his theory and the many preliminary experiments done by him and his students to corroborate and define his thinking. The Appendix to that work is an article which he completed for publication just two weeks before his sudden death in February 1971. It summarizes his theory and the experimental work during the time I worked with him. These notes were made as each experiment was being performed. Figure 1 in the Appendix to New Horizons is a detailed diagram of our specially built power supply and the setup for measurements which we used throughout these experiments. Figures 1 and 2 in my book, The All-Electric Motional Electric Field Generator and Its Potential, shows diagram of the design of the generator and a picture of our experimental setup with the generator in a shielding box along with the head of the Keithley 640 Electrometer which was our measuring device. The very first experiments with this generator seemed to confirm the theory, but, as with any dedicated researcher, Dr. Hooper then set out to prove his theory beyond a reasonable doubt. He was determined to prove that there were not extraneous forces, particularly electric fields, that were giving false results. The work sometimes was very discouraging, but when answers came they were often a confirmation of the fact that we were generating this unique field, and we had to learn to better understand how it worked. One case in point was when we discovered that when resistance was added to our circuit it increased the size of the field we were generating. At first this was very puzzling, but then Dr. Hooper realized that what must be happening was that a decreasing number of electrons were drifting through the copper wire, but at increasing velocity. He then saw that if this generator were made of different materials it would give insight into exactly what was happening when a potential difference was applied to any material. He also realized that materials other than copper or metals, might be better for generating this simulated gravitational field. He felt that experiments of this nature could be used to help explain the phenomena of superconductivity which had begun to show great promise at the time these experiments were being conducted. One of the problems encountered in superconductivity is the intensity of the magnetic field produced in the applications. This would not be a problem if used to make a motional electric field generator because of the non-inductive nature of the generator. And, Dr. Hooper felt that this would be one way useful anti-gravitational fields could be generated.